Let’s face it – vacations can be expensive no matter how you look at it. 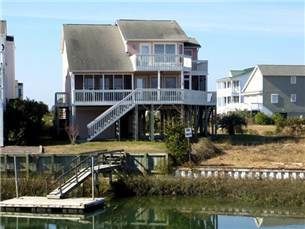 That’s why it’s important to take advantage of the Special Deals on Sunset Beach NC home rentals when they come up. You do that by staying current with our website and watching for specials on Sunset Beach NC home rentals. This home is 602NOR E – A beautiful canal home with a 20% discount through the month of July. This home can comfortably sleep up to 10 people. You’ll be able to enjoy views of the Intracoastal Waterway and marsh from the screened in porch. Keep your boat, kayak, and canoes at your own private dock. Enjoy basking on the sundeck or relaxing on the covered deck out of the sun. This recently renovated home has 4 bedrooms, 3 baths and a king, queen, queen, and two double beds. Baby gear comes with this rental. Amenities include washer/dryer, DVD, Grill, patio furniture, outside shower and TV. On this last minute special get 20% off on this mid-island canal home. This pet friendly home has 4 bedrooms, 2 baths and sleeps 8. Amenities include 2 color cable TV, DSL internet, washer/dryer, baby gear, grilling station with picnic table, outside shower. Bring your boat because there’s a new boat dock. Rear screened in porch overlooks the canal. Front porch offers views. If you’d like assistance finding your vacation rental just give us a call at 866-931-5201 and we’ll help you out.